An interior design & renovation consulting company based in The Woodlands, Texas. Brace yourselves. There are so many exciting transformations to this home and I can't wait to show you the process. You know those families that are just cool without even trying? That's Erin and Jeremy. They have a way of discovering the most intriguing art, traveling to special places, and caring for the cutest pup in the world (she'll make her cameo in a minute). Even more impressive, they do all this while crushing it at their day-to-day life of raising kids and working hard. I've known Erin for a couple of years and was flattered when she called about their kitchen/living room renovation. Because they’re so art-savvy, it felt as though we were all one design team. I have to give them credit - they came up with some incredible ideas and design solutions. Let's talk about what this space was before we reveal what it is. When we met for our first consult, I knew immediately why they were ready to renovate. While the entryway and dining room were up to date (with fresh colors and industrial materials), upon entering their kitchen, it felt like a different house. The stained wood cabinets, travertine floors, and dark green granite evoked a very different mood. It’s true, this style could fit someone with traditional tastes, yet it wasn’t them. So, we started brainstorming and made a few changes. Okay, we made a lot of changes. We started with the kitchen. Upon entering, your eyes immediately fell on the pantry in the center. While it worked, we knew that this particular space was longing to steal the show. We relocated the door to the bar area and replaced it with a 48” oven range, featuring a cement tile backsplash, satin brass pot filler, and shaker vent head (credit goes to Jeremy for identifying the door’s new location). See how dark the kitchen felt? The cabinet/counter combo almost made it feel like there was a barrier between the chef and guests. It closed off the space in a way that left it feeling less approachable. 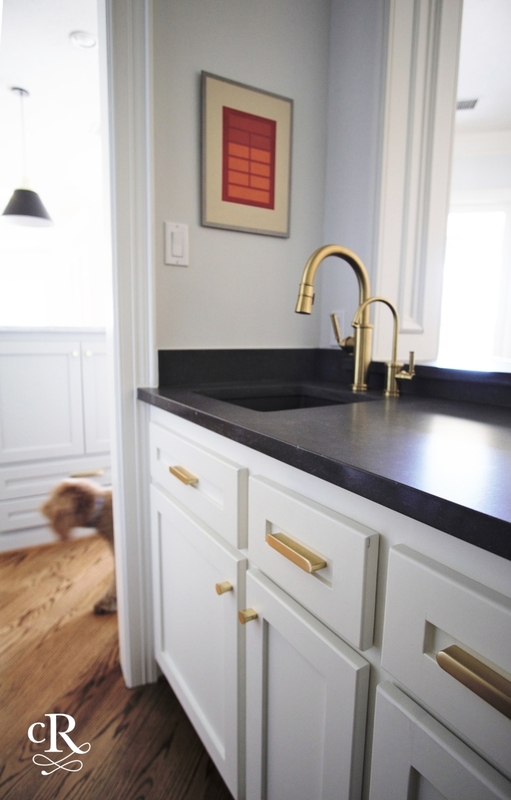 Our goal was to lighten this space up with softer, lighter materials and updated hardware. The room's aesthetic changed completely. Proposed location of new door. 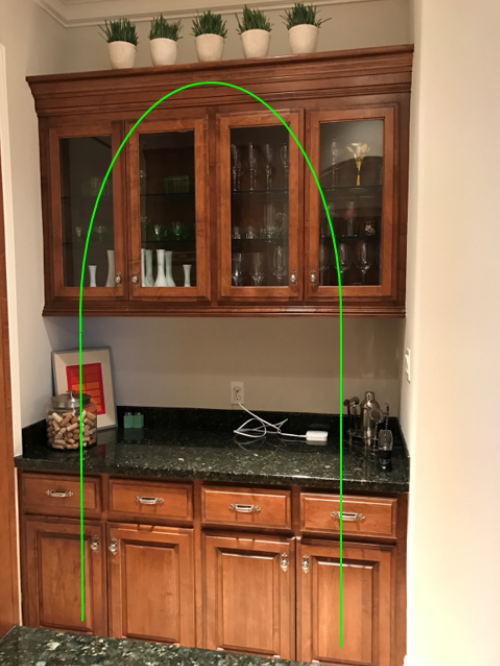 Remember where the old pantry door was? Here's the new one- surrounded in encaustic cement tiles. Pantry access is now where the cabinets were. 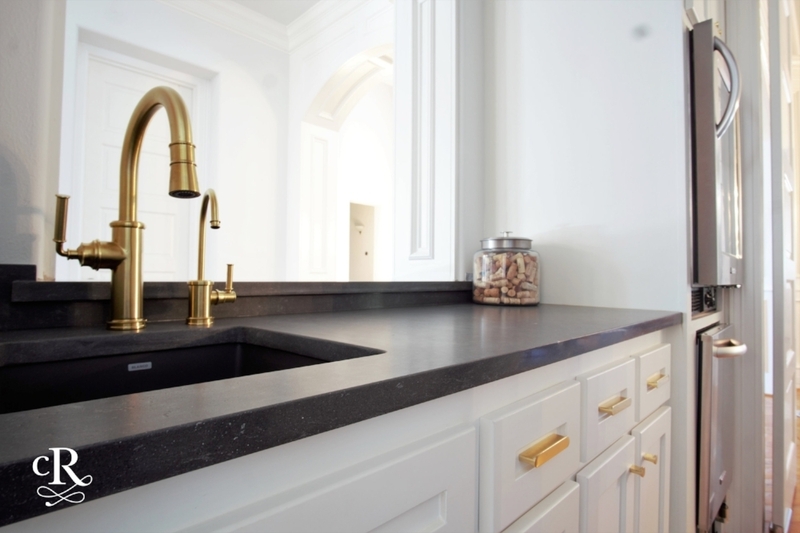 The fresh, new wet bar with dark charcoal quartz and brass plumbing fixtures. 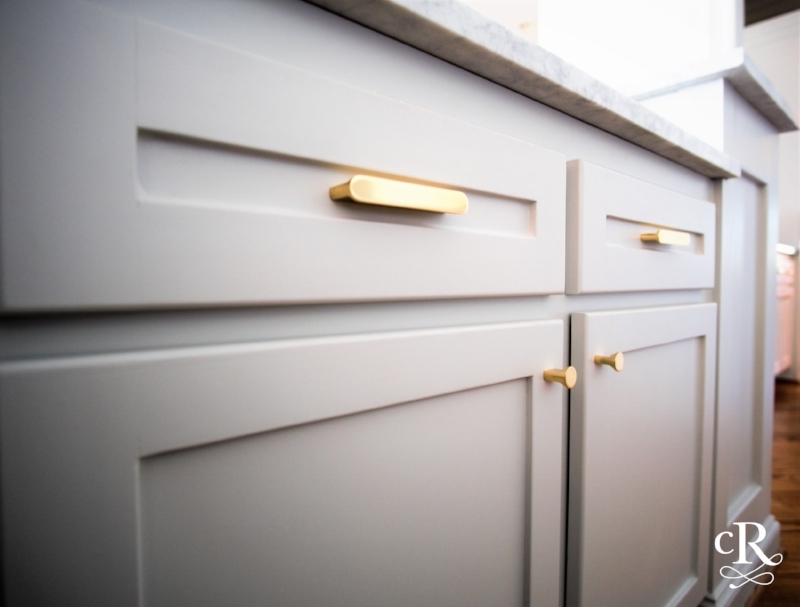 The satin brass added a great punch of contrast! Here are some other before and after views around the kitchen. We replaced the existing cabinet fronts with new, shaker panel doors. Marble & brass - Such a pretty combination! Let's talk about the living room. Erin and Jeremy really wanted a more crisp, clean, and functional approach to the living room. While the stained wood was beautiful, it seemed to darken the whole space. Not to mention, the built-ins limited the room’s flexibility. By removing these we were able to create room for an industrial shelving system. The fireplace’s existing paneling was removed and we designed a new, custom fireplace with white paneling and Calacatta herringbone marble tile. The hearth is quartz stone, almost identical to cement. Finally, by changing the paint to soft gray and updating the furniture, the room was transformed into a beautiful new space. This was an exciting project to be a part of. By making the adjustments mentioned above, we were able to help the family's personality shine in the spaces that once bored them. That's one of my favorite parts about this renovation: watching the new space unfold while developing a friendship with them along the way. Erin and Jeremy, thank you for this privilege!